I bought this scarf for my wife and daughter for X-Mas. It's lightweight, but has a quality that insulates, and warms. Keep warm when cool weather hits with this classic plaid fashion scarf. Crafted from a soft and cozy cotton blend, this scarf is available in multiple color options. The fringe ends give this scarf traditional styling. We are a small business located in New Jersey we have been in business since 2009 our very creative design team is constantly coming up with new and unique ideas on how to improve accessories and make them versatile for our growing client base. Nice quality scarf that has a soft feel that will help keep you warm on those cold, blustery winter days. 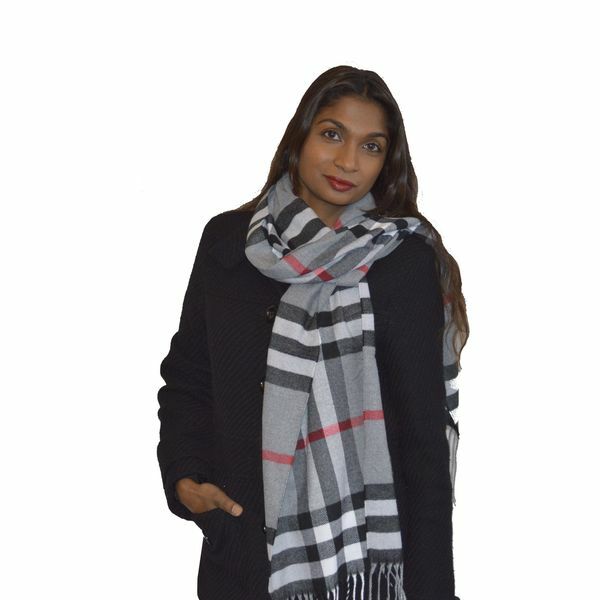 I purchased this inexpensive scarf for me and was so impressed with the price, I purchased one for our daughter too...and I like the androgynous pattern because they can also be great gifts for the men in your life! The item was not as wide as shows as in the picture. It look longer but it is not true. If you put it around the neck will go above at sholder level. I bought a better scarf from *** an a lower price, with the same patter. I love this! Wore it all winter with my black coat! I got lots of compliments! Scarf was extremely small, size did not appear as photo portrayed. Great product! We love em.